Mark Valley, who plays Christopher Chance in Fox's January-launching Human Target series, said the character is "a little darker" than he's used to playing. "He's got kind of a nefarious past that we haven't really ironed out yet and we'll probably be finding out," Valley said at the recent Comic-Con International. "It's an action show, so he does a lot of running around and isn't afraid to put himself on the line and risk himself for somebody else." Valley described this character: "I play a guy named Christopher Chance, who likes to fade into the background, just to try to blend in, make himself not noticed, identify the target and take the target out." The pilot episode -- which was screened at Comic-Con -- guest-starred Tricia Helfer. "Tricia's fantastic. She's very athletic," Valley said. "I think she wanted to do all of her own stunts. A matter of fact, she kind of insisted on it, which I was kind of impressed. But that meant I had to do those kind of stunts as well." Supervising producer Greg Weisman said he's awaiting word on a Season 3 of The Spectacular Spider-Man. "The short answer is we just don't have a pick-up yet," he said. "We're hopeful." The second arc of Season 2, featuring Venom, completed on Disney XD last Monday. 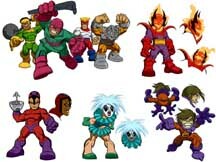 New-to-the-network episodes from Season 2 will resume in the fall on Disney XD, Weisman said. The remaining arcs will deal with a gang war and the Green Goblin. 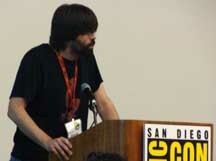 At his panel at the recent Comic-Con International, writer Joe Hill outlined plans for his Locke & Key series at IDW Publishing. He talked about Crown of Shadows, the third series, as well as a long-term plan for the franchise.